120 simple and delicious recipes in a cookbook that's chock-full of nutritional information and expert advice from Seattle's popular grocer, PCC Community Markets. Founded in Seattle in 1953 by 15 local families, PCC Community Markets (PCC) is the nation’s largest community-owned food market with an unmatched enthusiasm for making food from scratch. United in the belief that using real ingredients to create flavorful dishes is the only way to eat, PCC is a haven in the Greater Seattle area for those who share a commitment to fresh, local, organic, and seasonal foods, sustainably sourced from local producers, farmers, ranchers, and fishers. "Devotees of co-ops and farmers markets will appreciate the superb assortment of flavorful options as well as their relative simplicity in terms of sourcing and preparation. This is a truly delightful cookbook that focuses on whatever seasonal produce one might have on hand." 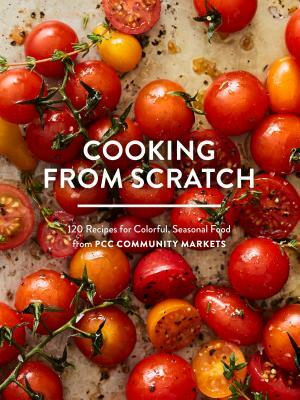 "Seattle-based PCC Community Markets is the largest community-owned food market in the U.S. We love that their gorgeous new cookbook emphasizes dishes you can make with seasonal, farmer's-market finds, many of which are also plant-based." "To celebrate its 65th birthday, PCC just released “Cooking from Scratch” — 120 recipes, including those for lots of favorites from its popular deli counters. Actually, the book includes the top-three PCC deli best-sellers: the chickpea-based powerhouse known as Perfect Protein Salad (of which they sell three-quarters of a ton per week); the feel-good-while-tasting-good-too chard-and-kale Hearty Greens Caesar; and the glossy, lemony-dressed Emerald City Salad...If PCC sounds more like a person than a corporation, that’s because it’s a co-op, owned and guided by its members — shoppers like you and me, almost 60,000 of them as of last year — rather than an engine of capitalism beholden to owners, investors and shareholders....PCC’s now a dozen stores strong, the biggest community-owned food market in the land." "Although PCC is celebrating 65 years, the local, community-owned group of food markets has never before released a cookbook. This book, released in September, gives customers access to fan-favorite recipes from the PCC deli, such as the Emerald City and Perfect Protein salads."